Welcome to part 5 of our series on how to answer every single GMAT problem you’ll ever see. 😊 If you haven’t already read the earlier installments, start with part 1 and work your way back to me. Is an “On-Demand” course right for me? Welcome to the fourth installment of our series on how to tackle every single GMAT problem. If you’re joining in the middle, go back and learn about the set of principles that tie together everything we need to do on the GMAT. Then work your way back to this installment. Recently, we took a look at a story problem dealing with ratios, and I finished up by giving you a second problem to test your skills. How did you do? Should I take a GMAT class or study on my own? Welcome to part 3 of our series on how to answer every single GMAT problem you’ll ever see. 😊 If you haven’t already read the earlier installments, start with part 1 and work your way back to me. How are you with story problems? 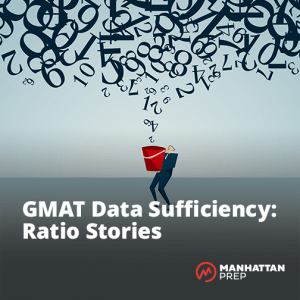 Most math concepts can be presented in story form on the test and the GMAT test writers do like to get wordy with us. You’ve got a double task: you have to translate the words into math and then you still have to do the math! How can we get through these as efficiently as possible? Try the GMATPrep® problem below and then we’ll talk about it. Give yourself about 2 minutes. Go! What are the dates for the GMAT? How often is the GMAT offered? When should you take it? How far in advance should you register? We’ve got the answers! Be sure to check back every Tuesday for a new video in our GMAT 101 series, detailing the answers to some of the most frequently asked questions about the GMAT. Last time, I introduced you to a set of principles that tie together everything we need to do on the GMAT.